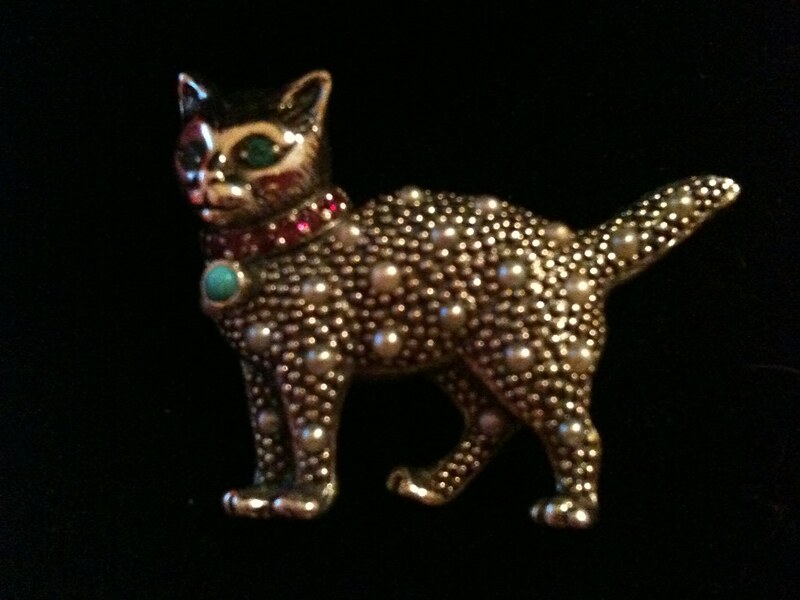 Today I am featuring my beautiful cat pin which I received for Christmas from Rydog. I was so excited to receive this unique and exquisite piece. It is from an antique store and is truly one of a kind. It features flawless craftsmanship with real emerald eyes, a ruby collar and pearls and a saphire on the body. It also reminds me of my first cat Puss since it bears many similarities in terms of appearance. I love this sentimental value. 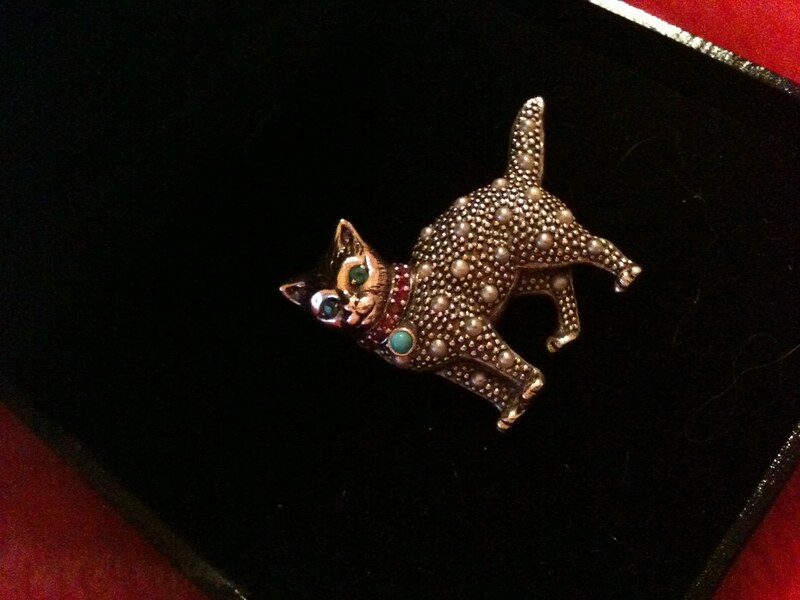 Also, my cat pin is a perfect way to add style and class to an outfit. I save it for special occassions and wear it with my pretty dresses. Typical outfits I’d wear my cat pin with are featured here and here. 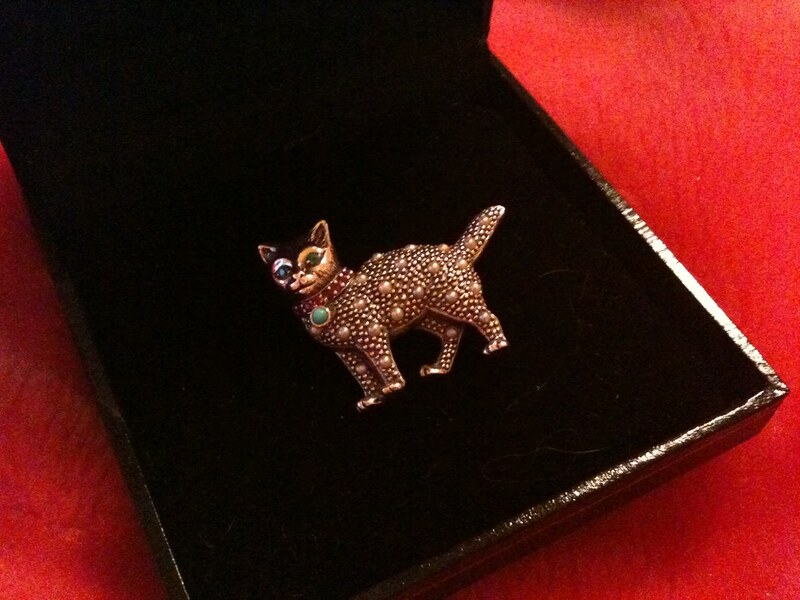 My cat pin is, without a doubt, one of the best gifts I have ever received. 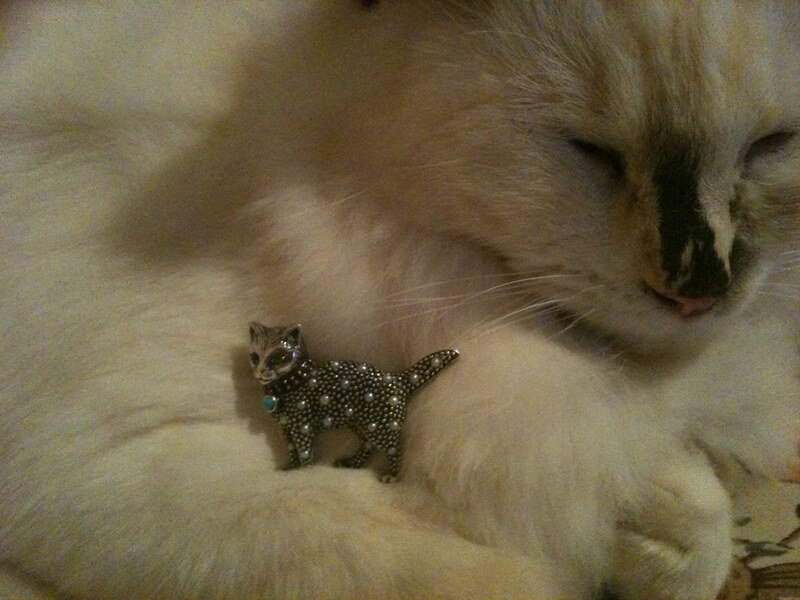 Juliette loves my cat pin too! What a lovely gift! It is very beautiful! Juliette and the pin are so beautiful! 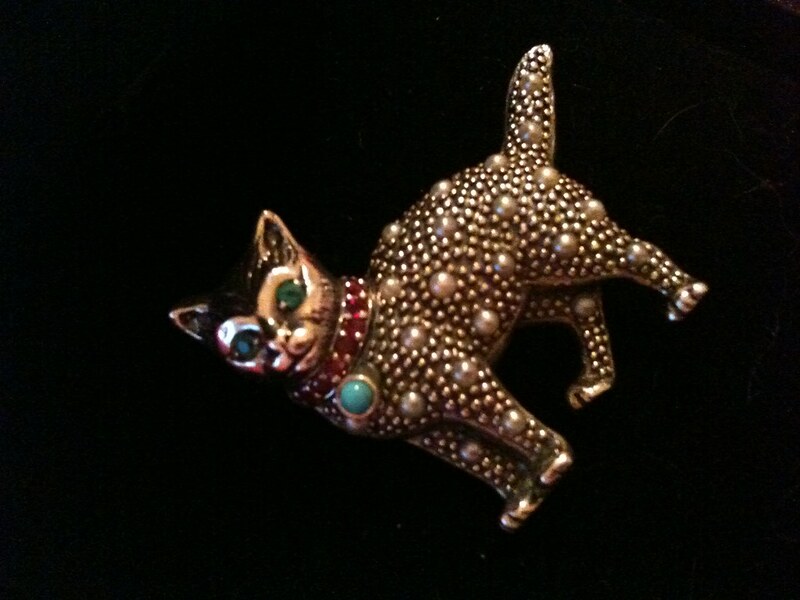 That cat pin is so gorgeous. And the picture of Juliette with the pin is so adorable. 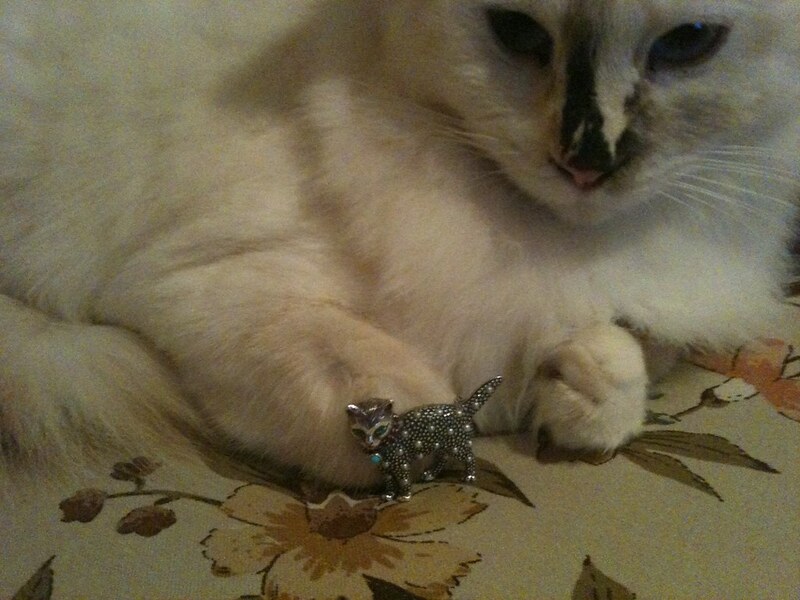 haha how cute is that, your cat playing with the cat pin. What a cool broach! I love unique broaches. It really is a cool pin! Such a great gift to receive a one-of-a-kind piece like that. Oooooh how awesome! I love a good pin and this one is particularly gorgeous! How cute! Such a lovely gift! It's precious. That's a gift from the heart. Thanks for posting the photos and feel free to drop by me too, soon. Just thought I would pop by your blog to say hello and see what youve been up to. I love your outfit in the last post, those pink pants are very awesome! Anyways, hope you are well and your uni is off to a good start for the year.